The meltdown will be real. Argentina are not out of the World Cup, not by a long shot, but you mightn’t be able to tell from the reaction back home as the eighth-largest country on earth, world footballing royalty who sure as hell know it, were held to a draw by World Cup debutants Iceland in Moscow. Most stunningly of all it was Lionel Messi who erred, his second-half penalty saved just as Argentina had appeared to be let off the hook for a performance that rarely fizzled and certainly never banged. Conventional wisdom was that Argentina’s only chance of winning the World Cup lay with Messi and this may still prove to be true. But Jorge Sampaoli may have bought too much into this belief, compromising the system that made him successful as a coach, a system that made teams greater than the sum of their parts, to accommodate its greatest part. Within his squad Sampaoli has the players to build a superpower but they were nowhere close at Spartak Stadium; dominant on the ball but only mildly threatening in attack and with a penchant for implosion at the back. Iceland were as you’d expect; resolute, organised, brave and direct. It wasn’t complicated but it was effective enough, the onus on Argentina to make something happen while throwing every hulking body they had in front of the ball. The most famous of those bodies is now that of Hannes Halldorsson, the goalkeeper who guessed right and palmed away Messi’s penalty that had been primed to win this game. From that moment on, another 35 minutes or so of backs-to-the-wall torture, Iceland held out. Sampaoli brought on a passer in Ever Banega, a finisher in Gonzalo Higuain and a dribbler in Cristian Pavon, all of whom improved the team. Neither could come up with the breakthrough though, even if Pavon should have had a penalty that was inexplicably not referred to the video referees. That point is likely to dominate the post-match discussion in most corners of the world but Argentina, a proud footballing nation, will not lose sight of the fact that they were held by a team few of their fans - a huge, boisterous travelling contingent - had given much thought to. There will be cries of shame, unjustified perhaps, but they will be noisy and certain to ramp up the pressure on the team and Sampaoli after a game that was the ultimate culture clash. While it might not feel like it in Buenos Aires tonight, one of the things that makes the World Cup so engrossing, so utterly brilliant, is that culture clash element. The tournament becomes an artist’s palette of the globe’s footballing identities, where stereotypes are busted and educations handed out. In the digital information age there are fewer surprises than in decades gone by but there is still a sense of adventure and the unknown. It breeds excitement and unpredictability which, ultimately, are what most of us crave in sport. Europe vs South America is a fairly classic culture clash, all told, dating back to the first-ever World Cup games but even in the European Championships of two summers ago, in the all-knowing era of 21st-century football, Iceland were a curious outlier, a team like no other. Iceland caught the imagination by being the ultimate unit. They appeared a team that was built like the volcanic rock from whence they came, fully-formed as they emerged from the magma all flowing locks and bushy beards. Their football was agricultural - as it was at times today - but they fought so hard and they sacrificed everything. It doesn’t always win games but it rarely fails to win hearts and minds to see a small nation, disadvantaged against far greater adversaries, punch above their weight and in some memorable cases land the knockout blow. They found any edge possible on their opposition that they could. We will run further, tackle harder and be more organised. We will maximise set pieces, profiting from the background of former handball star Aron Gunnarsson to become one of those rare teams that are lethal from throw-ins. And if Iceland are the ultimate unit then today they came up against the ultimate individual. This game was not just a clash of footballing cultures but elemental composition. In the red corner, a team first and foremost from the smallest World Cup country ever. In the blue one, a 5ft 7in man with the weight of one of football’s great nations on his shoulders. At the crucial moment of this game, though, he failed. And if Iceland were the ultimate team then Argentina were anything but. Sampaoli’s job is to make the most of his elite matchwinners and hide his more average players but the fragility of this defence suggests he’s not doing that yet, while the last thing a ropey backline needs is a goalkeeper who creates unease in the way that Willy Caballero seemed hellbent on doing all afternoon. Predictably Argentina were most dangerous when Lionel Messi found himself in possession and for all the courage and guts in the world, Iceland couldn’t cope with one of the greatest players to ever kick a ball running at them. Often he was forced to run sideways by a wall of white shirts but then it opens up new dangers, an obsession with stopping Messi creating one-on-one matchups outside. 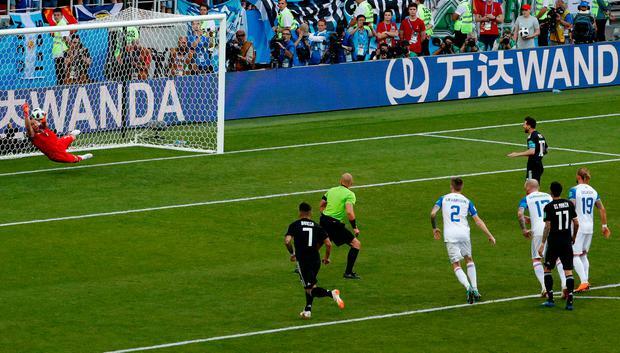 Sergio Aguero put Argentina ahead by cushioning a fizzed pass and turning neatly to rifle home on his left foot. At that point you wondered if Iceland’s plan to sit deep and soak up pressure might backfire when faced with such ruthless attacking talent but it was the void of defensive talent at the other end that would ensure this remained an even contest. A simple long ball was enough to put Argentina’s defence on roller-skates and both Alfred Finnbogason and Birkir Bjarnason could have profited from the Albiceleste’s desperation to implode before Finnbogason eventually did. And once that seed of uncertainty was planted, the flimsiness of this back four - comprised of two left-backs, a centre-back and a right-winger - was exposed to the world. Spain and Portugal showed on Friday night that they are both fallible teams but Argentina were at times laughable, rocked by the basics of their opposition but unable to accomplish the basics themselves. You still have to believe they are contenders but you just need to try much, much harder after this. For the tens of thousands of Argentina fans that travelled tens of thousands of miles to be here, it was an intense culture clash with the pockets of deep-blue Icelanders that came to the World Cup for the first time. They all sang and they all hoped but while one set of fans came into this game thinking they could win the World Cup it was the other who celebrated as if they had done at the final whistle. Fittingly it was Messi again who was primed for the big moment, standing over a free kick with the clock ticking down in injury time. His effort clattered into the wall, a fitting metaphor for what Argentina had done all day faced with an opponent so different, so resolute. The culture clash is real and that, as much as Iceland coming to a World Cup and containing one of football’s greatest-ever players, is what makes this tournament so special.